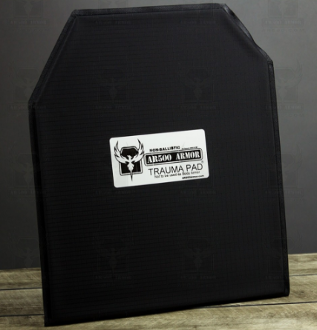 Trauma Pad - 10" x 12"
Our Products >> Trauma Pad - 10" x 12"
What happens after AR500 Armor® body armor defeats a round? This is a common afterthought. Energy from the impact is transferred to your body. Now what? The follow up question is typically how much energy and how do I prevent injury? Well, there is no specific answer without knowing all variables in the equation. Because life is uncertain we always recommend running AR500 Armor® Trauma Pads. Each trauma pad is specially engineered to mitigate blunt force trauma in case your armor takes a round. Our Trauma Pads will reduce the amount of back face deformation that could occur and reduce risk of injury after impact. All AR500 Armor® in standalone configurations perform very well in tests against back face deformation (BFD) and energy transfer, and are designed with BFD in mind. Our Trauma Pads add to the level of effectiveness already exhibited in AR500 Armor® Body Armor. Designed to be worn in conjunction with and behind your body armor, our Trauma Pads reduce the amount of energy transfer to your body, reducing felt energy through your armor. Our patented Advance Shooters Cut (ASC) matches perfectly to our Level IIIA, III, III+, and III+ Lightweight body armor improving ergonomics with your rifle. Compatible with AR500 Armor® Body Armor and other armor systems along with most plate carriers.